Nitto returns once more as a major sponsor of the Formula Drift series, 2014 marking nearly a full decade of involvement with the sport. Following suit, the team at Nitto has just released their latest renderings of the 2014 Nitto-sponsored cars. Vaughn Gittin Jr returns to the series under the Nitto name once again, with his updated Monster Energy/Nitto Tire Ford Mustang RTR. Gittin and the rest of the Nitto team will be running the NT05, as well as receiving on-site support from the Nitto techs. New to the Nitto team is S14 driver Matt Field in his CX Racing Nissan S14. We've watched Matt has worked his way up the ranks, and he continues to solidify himself a serious competitor in the world of Formula Drift. Our friends at Rotiform are back as a sponsor as well, and we're eager to see what wheels will grace the car this season. Matt should make for an exciting addition to the team; as Nitto states, "Matt’s aggressive and wild driving style makes him a fan favorite and he pushes top competitors to their limit." 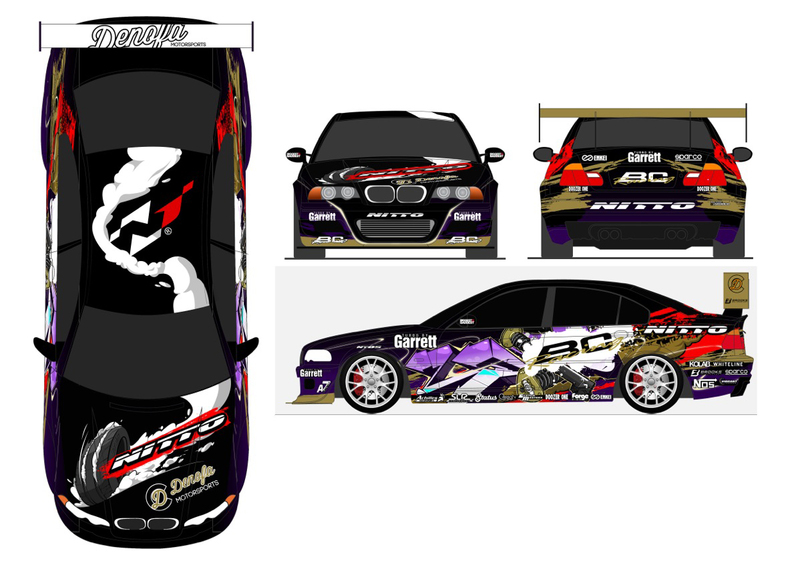 Returning to the Nitto roster this year is Chelsea Denofa and his E46 BMW. Denofa's driving style has always been a favorite of ours here at StanceWorks, as he often pushes the limit far further than any other drivers in the field. He embraces the motto of "Go big or go home." Rumor has it that the E46 has been rebuilt over the off season to handle more than 1000 horsepower as well. The Nitto lineup is rounded off with the welcoming of Odi Bakchis to the team, as well as his Feal Suspension S14. Odi has gained notoriety and a following as of late, and the latest iteration of his car is sure to take him further than ever before. The first round of Formula Drift is just days away, and we're eager to take part and shoot as it happens right in our back yard. For those who follow the sport, keep an eye on the Nitto team - we'll be watching closely, hoping for that sweet spot atop the podium. The first circular of System Move is just times away, and we’re desperate to take aspect and capture as it happens right in our garden. For those who adhere to the game, keep an eye on the Nitto group – we’ll be viewing carefully, expecting for that lovely identify on top of the stage.